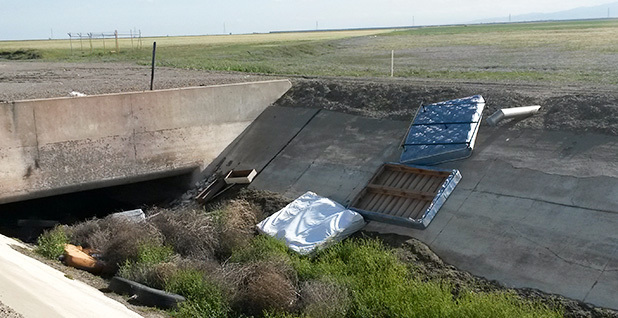 Debris litters the San Luis Drain. Photo courtesy of the Westlands Water District. MENDOTA, Calif. — Driving down Highway 33 through California's Central Valley, signs of the state's ongoing drought — and water wars — are everywhere. Fields of green winter wheat and diagonal rows of almond trees alternate with brown fields. Billboards every few miles read, "No water = No jobs." "I don't know who put that sign there," said Tom Birmingham, the general manager of Westlands Water District. "But what it says is accurate." Westlands, the largest agricultural water district in the country, is at the center of it all; the region has some of the most productive farmland in the world — but very little water. A Greenwire two-part series. Water is scarce in California. Westlands Water District is at the center of the fight for more access -- but it's facing increased scrutiny over its finances, leadership and politics. Click here to read the second part. The 64-year-old water district is big: about 1,100 square miles, a 75-by-15-mile rectangle stretching northeast and southwest on the western side of the Central Valley. It generates $1 billion per year in crop sales, mostly from pistachios and almonds but also from lettuce, tomatoes, asparagus and a dozen other crops. And the amount of political clout it wields is equally big. The district is currently pushing to increase its water deliveries, which environmentalists say would come at the expense of fish and farms elsewhere in the state and water quality in the state's main water hub, the Sacramento-San Joaquin River Delta. And it's negotiating a deal to clean up salt and selenium buildup that has contaminated the district's groundwater and soils for decades in exchange for more secure water rights and hundreds of millions of dollars of debt relief from the federal government. But Westlands has its share of critics, and a series of recent woes has brought it under increased scrutiny. In March, the Securities and Exchange Commission fined Westlands for overstating the amount of money it had on hand when it sold bonds to investors in 2012. "It's not a small matter to be found to be — if you will — cooking the books by the SEC," said Patricia Schifferle, a former California legislative staffer and environmental activist who has followed Westlands' activities for years. While the securities violation itself isn't likely to hurt Westlands' financial prospects, it raises questions about the district's business model, which relies on relatively cheap water that it receives from the Bureau of Reclamation's Central Valley Project. When those deliveries don't materialize — and they often don't; Westlands is among the last in line in terms of water contract seniority — the district has to buy water from more senior water rights holders and raise prices for its member farmers. "It makes it extremely tough," said Rick Blankenship, vice president of farming operations at Woolf Farming Co. of California Inc., which at 25,000 acres is the largest farm in Westlands. "I don't know where it's all going to end up, but it's going to be tough." Woolf plans to fallow about 9,000 acres of row crops this year and devote the farm's scant CVP resources to protecting its 5,000 acres of almonds and pistachios, which as permanent crops require annual watering. The complaints of Westlands' transgressions against the environment are legion. But it was never found doing something flat-out illegal — until now. 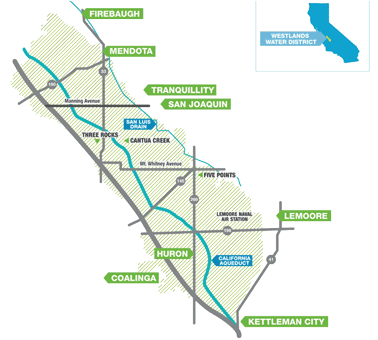 The Westlands Water District occupies a 75-by-15-mile swath of the San Joaquin Valley. Map courtesy of the Westlands Water District. Rather than raise rates for its customers, Westlands in 2010 decided to reclassify reserve funds as revenue in order to demonstrate its ability to meet its debt coverage ratio, as promised to bondholders who bought its debt. On March 9, the SEC announced a $125,000 penalty against Westlands for overstating its financial security in 2010 through "extraordinary accounting transactions" and in a subsequent $77 million bond offering in 2012. "The undisclosed accounting transactions, which a manager referred to as 'a little Enron accounting,' benefited customers but left investors in the dark about Westlands Water District's true financial condition," said SEC Enforcement Director Andrew Ceresney. It was only the second time the SEC had ever levied penalties against a municipal bond issuer. In addition to the penalty against Westlands itself, Birmingham paid $50,000, and a former assistant general manager, Louie Ciapponi, paid $20,000. As an explanation, Birmingham said federal water deliveries from the Sacramento-San Joaquin Delta were low that year because of protections for delta smelt that first kicked in the previous year. "That was the first year after the implementation of the smelt biological opinion, and so our water supply was much lower than we had anticipated," he said, while stressing that the terms of Westlands' settlement with the SEC prevented him from admitting or denying the commission's findings. "We've got $40 million in the bank, and one year we had a hiccup," he said. "I neither admit nor deny the findings of the commission, but I don't think the commission said that Westlands couldn't pay its bills." On March 10, Fitch Ratings Inc. said it might downgrade Westlands' bond rating based on the order. Downgrading the district's $193 million in bonds would raise its perceived riskiness. Environmentalists who have been dogging Westlands see the SEC citation as a chink in its armor that could demonstrate inability to finance a major project to build tunnels underneath the delta to improve reliability of deliveries. On July 12, Fitch removed the negative ratings watch, saying the SEC and Westlands' actions since then "mitigate the risk of future misrepresentations and omissions by the district relating to district financial results." "The SEC found that they basically cooked their books," said Schifferle. "The question is, going forward, will they have sufficient revenues in water sales and land charges to meet these incredible costs — for cleanup of all the toxic groundwater within the district, to pay for the tunnels, and to do that on falling water sales and increased debt costs?" she asked. "That is a serious question that we don't know the answer to, but right now they are working feverishly in Congress to make sure they get these financial benefits," she said. "It would make their balance sheet look a lot better." One investor who owns about $5 million of Westlands bonds said Fitch's move in March didn't affect his opinion of Westlands' creditworthiness and might even encourage him to buy more. "Demand for California [municipal] bonds is so high and interest rates are so low, I wouldn't see them having an issue at this point," said Michael Johnson, head of research at Gurtin Fixed Income Management LLC, an investment firm with about $10.3 billion under management. "If the market starts to react and gets spooked and we start to see these bonds offered at interest rates that make sense for us, we're more than willing to buy." Johnson doesn't necessarily think Westlands is in great financial shape, though. Gurtin has rated Westlands' bonds as a BBB, five grades lower than Fitch's current AA- rating and four grades lower than the A+ rating from Standard & Poor's Financial Services LLC, which decided on March 25 to maintain its current outlook. Anything lower than BBB- is considered too risky for banks. "We have a much different opinion of the credit quality than Fitch does," he said. Risk factors include its junior water contract status as well as the fact that agricultural customers won't pay as much for water as residential customers will — the same underlying issues that led to the SEC violation. "We view their finances as being adequate, and this is after significant rate increases," Johnson said. "There's still long-term water supply issues, as well. When you put all that together, we see it more as a BBB than an AA credit." Lawmakers who are probing Westlands' other activities see the SEC settlement as one piece of a larger puzzle. "I know it can't help that they were caught with their hand in the cookie jar lying to their bondholders," said Rep. Jared Huffman (D-Calif.). "There's a lot going on right now; you have to have your eyes wide open and look very closely at all the moving parts." Westlands is urging Congress to fund a fix for a problem that has been dogging the district since its formation: salt- and selenium-laden irrigation runoff pooling underneath much of the district thanks to a thick layer of clay that keeps water from descending to deeper levels. The Bureau of Reclamation started building a drainage system, including canals and artificial wetlands to absorb the runoff, but failed to complete the full 290 miles to the ocean before salt and selenium buildup at the Kesterson National Wildlife Refuge began causing bird deaths, embryo deformities and fish deformities. The subsequent closure of the San Luis Drain in 1985 and ban on depositing runoff into the drain, where it would eventually discharge into the San Joaquin River, meant Westlands developed one of the most advanced drip irrigation networks of its time in order to reduce runoff. Eighty-five percent of the district's crops are watered by subsurface irrigation — flat, perforated hoses that underlie each furrow and dispense water according to soil-moisture sensors, avoiding evaporation losses. 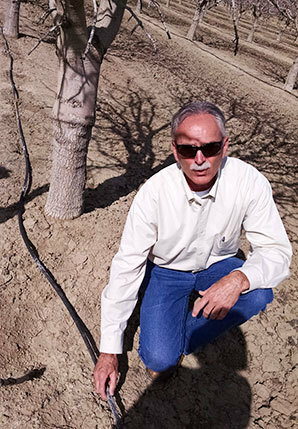 Rick Blankenship of Woolf Farming demonstrates drip irrigation in a nut orchard. Photo by Debra Kahn. "There is not one drop of water that leaves Westlands Water District," Birmingham said. "The farmers in Westlands are the most efficient farmers in the world." After years of litigation, Reclamation proposed a settlement last September that would have Westlands assume responsibility for its drainage issues and drop its suit against the Interior Department in exchange for forgiveness of its outstanding debt from the construction of the CVP itself — a value of about $350 million. Westlands also agreed to retire at least 100,000 acres of salty farmland and reduce its maximum water deliveries from the CVP by 25 percent, to 890,000 acre-feet per year. Westlands would also receive an upgrade to a permanent contract, rather than one that has to be renewed every two years. The value of that benefit is immeasurable, as contract renewals provide Reclamation an opportunity to change the terms of its agreements — to provide less water, say, or require that the district retire more land. With a permanent contract, the revenue coming into Westlands will be more secure, although it can still have its deliveries cut if supplies are short. The permanent contract also will allow farms larger than 960 acres to be newly eligible for discounted water. Reclamation and Westlands say the deal would save Interior up to $3.5 billion in drainage costs that it would otherwise be liable for if Westlands kept pressing for a resolution in the courts. Critics argue that Westlands has already retired nearly that much land, rarely receives its full allotment of deliveries anyway, has no concrete plan to deal with the drainage, and is legally responsible for solving its drainage problems even without the settlement. Huffman and other Democratic House lawmakers called for an investigation into the deal in April and released a report by the Congressional Research Service flagging potential holes in the settlement, including the fact that it doesn't specify a timeline or specific actions Westlands must take to manage the runoff. "You can bet there are extra angles both you and I haven't seen," Huffman said. "That's why we want to see more of an investigation. There's just a lot of things here that don't add up." The dilapidated 85 miles of the San Luis Drain that Reclamation did complete in Westlands' boundaries is still in need of remediation, and Westlands hasn't said exactly how it plans to complete the job. It has spent $8 million researching ways to solve its longer-term drainage issues, including evaporating the salty water in gravel beds, processing it with a solar-powered desalination plant, sucking it up by planting nonagricultural shrubs and injecting it far underground. Westlands insists the deal is a good one for taxpayers. "Everything is in the eye of the beholder; people who want to be critical of Westlands are going to say it's a government giveaway," Birmingham said. "From my perspective, we are letting the government off the hook, and we are taking on an enormous risk." Fitch analysts agree the settlement could be risky for Westlands. The same day Fitch lifted its SEC-related negative watch on Westlands' bonds, it announced a negative ratings outlook based on the drainage settlement. While analysts looked favorably on the forgiveness of CVP construction costs and the permanent water contract, they said the drainage obligation itself could force Westlands to take on significantly more debt. They estimated the settlement could cost Westlands $400 million to 800 million, which at the higher end would represent four times the district's current outstanding obligations. Another longtime observer thinks the endgame might be to sell water to wealthier municipal customers, as Westlands is already doing in some cases. It's selling water to Naval Air Station Lemoore for $1,100 an acre-foot, compared with $315 an acre-foot for agricultural customers receiving CVP water. The district has also sold a significant amount of land to solar power projects and donated some land for a federal prison and is sponsoring a bill in the state Legislature that would require state agencies to consider siting renewable energy projects on salt-impaired farmland. "These aren't farmers, these are investors," said Lloyd Carter, a former United Press International and Fresno Bee reporter and deputy district attorney who has made a career of following Central Valley water issues. "It's a place where people can park money, and if they lose money on their so-called farm, they can write it off." Even if Westlands catches all of its water before it leaves the land, the soil itself is slowly becoming saltier. "They have never solved the drainage problem out there," Carter said. "They can probably squeeze a few more decades out of the land before it salts up. When it does salt up, they'll just start to urbanize it. "What's valuable in the Westlands, the land or the water?" Carter asked.